« LOCAL HEROES. A tribute for Remembrance Day 2017. November this year has started warmer than average, so we see cattle out in the fields that would normally be housed by now. The field at the top of Barrow hill has been planted with mustard. This is what is known as a cover crop. This material provides cover and a good habitat for wildlife during the winter and will then die down in early spring, returning green manure to the soil, before being planted with a cereal crop. See more on Sulgrave farming in November by clicking on “read the rest of this entry”. The concrete road used so by so many of us for recreation has winter wheat planted all the way to the bridge. A farmer has a wide choice of wheat varieties to select from, some are for milling, others for animal feed. His choice of variety is dependent on soil type and whether he wishes to go for yield per acre( feed wheat) or milling slightly less yield with higher inputs and higher value. The concrete road is a unique feature in our parish. How did it come about? It was laid down in the late ninety forties by Wootton Brothers of Sulgrave . Queen Anne’s college Oxford the landlords put it in for their tenant at Rectory farm a Mr Digwood. With the farm and buildings at the end of a long thin stretch of land reaching beyond the railway, it made sense to have good access to the fields, for both stock and implements. Since those days some hedges have been removed making larger fields and the Farm house sold off. The land is now farmed from Weston and the road still used for farming purposes. The old cowshed is still just standing. So it is worth remembering and respecting the fact that this road is neither a footpath or right of way but an amenity of great value to us all. “Concrete Road” shown in red. 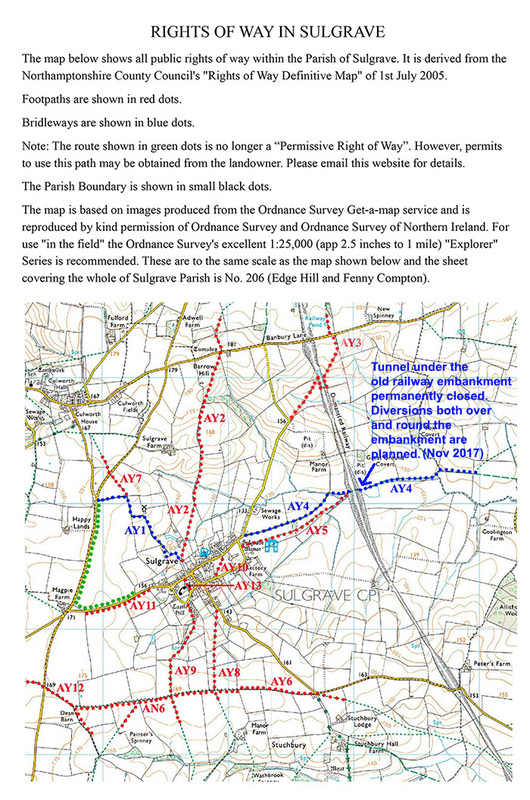 Click here for Sulgrave Parish Rights of Way. Finally our sheep flock should now be all in lamb and in my December notes I will update again on their journey to lambing. If these notes raise questions please don’t hesitate to ask. This entry was posted on Tuesday, November 14th, 2017 at 8:44 am	and is filed under News. You can follow any responses to this entry through the RSS 2.0 feed. You can leave a response, or trackback from your own site.